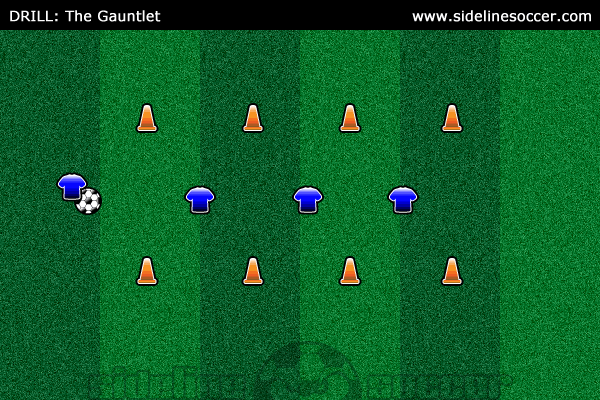 The Gauntlet is a drill that can be setup and played in a few variations, but the concept is the same. Attackers must get through a series of defenders in different grids. The main focus of the drill is controlled dribbling and quick speed while maintaining awareness of defenders. Setup three grids, approximately 10×10 yards, one after the other. Have a defender stand in each of the grids. Attacking players line up at the beginning of the first grid. An attacker will attempt to go past each defender without going outside of the grid. The defenders can only defend their 10×10 grid. If the attacker gets by the defender, they then take on the next defender. If an attacker makes it past all three defenders, then the attacker takes the place of the last defender and all defenders move up a grid and the first defender becomes the attacker. If the attacker fails, and one of the defenders steals the ball, the players then switch. The original attacker becomes the defender of the grid and the new attacker then tries to go through the gauntlet. Attackers should keep the ball close to them and stay in control when dribbling. Attackers should also keep their head up and dribble to space to avoid pressure from defenders. Advise players to use a quick move and then burst into speed past the defender. The Gauntlet can be played in many variations. The grid sizes can be made smaller or larger depending upon the age and skill of the players. The number of grids and/or defenders in each grid can be increased as well. Have some players line up on the sides of the grid. These players can be used for wall passes, quick give and goes with the attacking players. A goal can be set up at the end of the gauntlet, so that if attackers get through the defenders, they need to take a shot on net. Instead of having one attacker go through the gauntlet at a time, send all the attackers through, trying to avoid the defender. If the defender wins the ball and kicks the ball out of the grid, that attacker becomes an additional defender (without a ball) on the next series. The last player to make it through the gauntlet wins the game.